Pitch Lab @ Women Who Startup Headquarters! Working with Lizelle and Women Who Startup was one of the highlights of our year! Not only did Toni Mays kickoff the workshop with a story about the importance of women in leadership, but we had the opportunity to share the stage with comedy great Nancy Norton! It was so much fun learning from Nancy's 20+ years of stand-up comedy experience and hearing her amazing personal stories about comedy legends like Mitch Hedberg, Dane Cook and Ellen DeGeneres! "Together Jay and Nancy led us through a brilliant, fun and engaging evening workshop that gave everyone many new perspectives by using comedy as a powerful tactic to not only engage an audience of any size but to also practice a completely new way to present information with a different tone, tempo and outcome that many have never even considered." "Jay has such a unique background as a salesperson and a comedian that all his experience and advice are so fresh and on point. He really delivered (unlike most other people who give textbook advice but don't have any stage presence). Thank you so much for sharing your stories. I was completely hooked the whole time." "Jay and Nancy were great! This fun and useful workshop included specific strategies for engaging your audience and taking control of the room when presenting which I will definitely put into action!" "Comedy Karaoke was a brilliant exercise that helped many break through their fears of public speaking and very quickly created comradery amongst a group of strangers." How To Be A More Confident & Engaging Storyteller @ General Assembly! In this workshop hosted by General Assembly Denver, Pitch Lab helped a diverse group of professionals from DaVita, Monarch and Company & Ibotta learn how to be more confident, engaging storytellers. Tim Shisler, founder of RackFocus, was on hand to share a decade worth of startup storytelling experience he's gained from working with organizations like Techstars, Denver Startup Week and TedXBoulder. Kylie B Kicks off our Storytelling workshop at General Assembly Denver! First we dove into the essential elements of telling a great story including why you need to keep your setup brief, the power of segues and the importance of authenticity + vulnerability to build trust. Then Tim took the stage to share examples of how Amazon and Twitter use vibrant details to make their stories memorable. And how Hollywood stories amp up the drama to create captivating scenes as illustrated by the Square Peg in a Round Hole scene from Apollo 13. After a brief breakout session, attendees practiced crafting their own personal stories and received actionable feedback from Tim on how to make their next presentation more memorable. All the attendees shined in their final presentations and in closing out the workshop Tim reminded us that storytelling is a process and pointed to Ira Glass' fantastic quote on why great storytelling takes time and hard work. Pitch Lab joined Moore Communications Group for an afternoon to improve pitch delivery while intertwining interactive exercises to build new strengths for their customer facing team. The workshop concluded with a few brave members of the MCG team being put to the test by presenting a humorous, fictional product pitch for 3D Cheese Printers! Together we broke down stand-up comedy techniques the pros use on stage to help MCG team members be funnier and more engaging during their sales pitches (minus a few of the dramatics and most of the profanity). Not only did the exercises elevate their public speaking skills leaving them with actionable takeaways, but it served as a fun event that united the team by forcing vulnerability. Ladies and Gentlemen... Jay Mays & Tommy Y! Whether you’re pitching a product or service or trying to convince your significant other how much you need that Harley or pair of Gucci pumps, our pitch tips can help you get that ‘Yes’ you’ve been hoping for. Pitch Lab at Thrive Workplace ft. Ben Kronberg from Comedy Central! On a somewhat standard Tuesday, a group of salesmen, entrepreneurs, and creative minds gathered at Thrive Workplace to learn about and practice public speaking. What made this Tuesday special was Ben Kronberg from Comedy Central, Late Night with Seth Meyers & Jimmy Kimmel Live was on hand to break down stand-up comedy techniques the pros use on stage to help these Denver professionals be funnier, more engaging speakers at work. Between the basics like breaking the 4th wall and dramatic pause, to the more advanced concepts like improv and storytelling during sales, attendees got to practice telling jokes, improvising and mirroring one another. If you're interested in learning a thing or two about public speaking and incorporating humor into your pitches, join us at our next event! Pitch Lab Headlines Denver Startup Week 2017! 2017 marked Denver Startup Week’s 6th birthday and a record breaking 18,900 registered attendees! Pitch Lab was honored to be selected for two headline sessions during the week. These events were without a doubt, the highlight of our year. Over 1,100 folks registered to see Pitch Lab's workshop and we had a blast helping Denver’s startup scene find its funny! Big thanks to John Wilker for all the hospitality and support. Below are our favorite pics from Battle of the Startups: Entrepreneurs vs. Comedians week courtesy of Jim Darling. cristian Whitney, Pitch lab creative director, kicking off the night! JAY mays, pitch lab co-founder, explaining why we're here. Pitch lab panelists: tommy y, heidi mcguire, joel lutz & rj owen! Chris Franks, CEO CleverFunnel Marketing, Pitching Meat Water! JD Lopez, Comedian & Producer of Left Hand Right Brain Podcast, Pitching Rx Windshields! Anthony Franco, CEO mcSquares, Pitching 3D Cheese Printers! Daniel Reskin, Comedian & Pitch Lab Stand-Up Comedy Coach, Pitching Energy Drinks for Zoo Animals! AmeriCorps VISTAs Improv Comedy Workshop! Cities of Service Resilience AmeriCorps VISTA members are called upon to strengthen climate-resilience planning and implementation in vulnerable communities. These real-life superheroes provide services to U.S. cities by engaging community residents to improve resilience in low-income neighborhoods. In this role, they help equip low-income communities to better prepare for numerous risks and challenges, including those associated with climate change. Pitch Lab was thrilled to help The AmeriCorps VISTA program utilize improv comedy skills to problem-solve within the vulnerable communities the VISTAs serve. And no one knows better than improv coaches, RJ Owen & Joel Lutz how powerful improv comedy can be as a tool for creative problem-solving. Through improv exercises like mirroring, 2-line scenes and spelling bees the VISTAs were able to hone in their active listening, collaboration and authenticity. Skills paramount to improving their effectiveness while impact volunteering. "I enjoyed the improv session because I tend to be a perfectionist. Sometimes it doesn't work out according to plan and I'm learning to embrace silence as a time to process the information given to me, so that I can give a thoughtful response." "During the improv session I was able to get a better understanding of my co-VISTA and how we work together." "An elevator pitch will only get you so far when reaching out to community members so having the improv session really stuck with me... and how I can react when residents throw me curve balls." "The skills taught in improv comedy are incredibly invaluable for this kind of outreach and engagement work, as well as for life in general." We're grateful for the opportunity to work with The Cities of Service Resilience AmeriCorps VISTAs and are always excited to see improv comedy's "yes, and" approach make a positive impact! And a BIG THANK YOU to General Assembly Denver for making this workshop possible. If you'd like to learn more about how Pitch Lab can help your team leverage improv comedy for innovation, creativity and team building, contact us! At Volume Nine, everyone joins in on a client pitch at some point, whether they’re leading the charge or there for support. While some are natural public speakers and thrive when pitching, others prefer to remain safely behind screens, making SEO magic happen. No matter our personal feelings about public speaking, everyone here at Volume Nine was excited to have Jay Mays, founder of Pitch Lab, stop by for an afternoon “beer-and-learn” talk recently. Jay did stand-up comedy for years and picked up a few tricks for engaging an audience – and keeping them engaged. 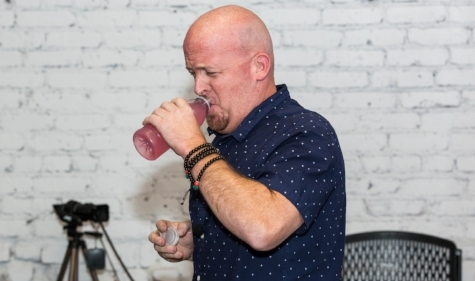 He rolls this into his 20 years of experience in sales and business development to create an awesome, funny, and educational workshop called Pitch Lab. During the workshop, he teaches how to become a better speaker and give better pitches, incorporating lessons from famous stand-up comedians. The workshop started with each member of the V9 team delivering jokes from Mitch Hedberg and ended with some brave V9ers pitching the team meat water, prescription windshields, and energy drinks for zoo animals. Along the way, we learned about engaging a crowd, minimizing stage fright, cutting out “ums” and “likes”, and much more. Even the most seasoned public speakers among us walked away with some new lessons about delivering an engaging pitch. carly webber, volume nine's social media lead, pitching meat water! Article originally published via Megan Duffy on V9 News. "Bring Your Own Pitch" @ Universal Mind! In the same way a stand-up comic hits an open-mic, Pitch Lab is designed to help you clock the 10,000 hours of deliberate practice Malcolm Gladwell says make a master. Whether you’re persuading a group of VCs, landing your next big client or preparing for an important speech, we all need practice to improve our pitch. Presenters pitched their deck for 5 minutes in front of an expert panel consisting of a stand-up comedian, improve coach, and professional storyteller. Our presenters received actionable feedback on how to improve their delivery, room command, and storytelling abilities. What was the best part? We all learned by listening to each other speak! Alison is a Colorado native; gold mining runs in her blood. Firmly believing it's better to sell the pick axes in a gold rush then own the mines, she left a 10-year career in recruitment to train tech recruiters on how to improve their success with an online training program called Recruiting Innovation. Solid mentorship eluded Geoffrey Poirier his entire life, so he founded Meometer to solve the problem of lack of mentorship. “I found a perfect match for my need to work on my Angel Investor pitch in public: Pitch Lab. I had not yet presented this new pitch to anyone and I needed feedback. I regard comedians as the height of intelligence and awareness so getting feedback specifically from comedy experts who have business minds too? Dreamy! "The feedback, besides being extremely helpful, was coming from professionals who have real world experience and insights into what it takes to get funded. So cool, thanks Pitch Lab!" Every year Americans spend millions of dollars on painful tattoo removals. Getting a tattoo is a serious decision that needs to be considered carefully. Inspired by his own desire for a memorial tattoo, Zach Cassidy developed InkMage, the best AR tool in the market to envision your tattoo before you ink! HUGE THANKS to Universal Mind for hosting us and all of our presenters, panelists, and attendees for making this such a great event. Keep practicing your pitch, Denver! Improv Comedy Workshop @ General Assembly! How To Use Improv Comedy As A Tool For Creative Problem Solving @ General Assembly! Pitch Lab instructors Joel Lutz & RJ Owen led us through a gauntlet of improv comedy exercises. We laughed a lot, but the real lesson at the heart of this workshop is to be a better listener. Whether it's in business or your personal life, there is power in letting go of your own personal agenda, being present in the moment and actively listening. This skill is paramount to successfully adapt to change, solve problems, or be a force for innovation. We also learned that great improvisers possess the top qualities Google looks for when hiring, including the ability to process ideas on the fly, willingness to relinquish power and ease with creating space for others to contribute. the team crushing 2-line scenes at general assembly! "I had no idea what to expect but absolutely loved the class and the exercises. I've always been very public-speaking phobic and calculated in how I communicate, so I learned some great lessons for relaxing and being in the moment that I'll apply to work and life!" "I've been to a few GA workshops and this was by far the most engaging and dynamic. Wonderful experience, and the time went by way too quickly!" "Do more of these unique business-related (and especially sales related) courses! I'll recruit all my colleagues." "This was one of the most helpful sessions I've been to."